I am a 45 year old living in Inwood, NY, a small section of Northern Manhattan. I have been living here for about 9 years, and it is very pretty; so much so, in fact, that I never plan to leave. I have a rare form of a relatively rare disease called ataxia. Ataxia attacks my cerebellum, a part of the brain whose functions include control of my balance, speech, and coordination. I was diagnosed with axtaxia in the summer of 1997. I can’t truly feel that I have come to terms with this disease because it is progressive. Changes don’t come on a schedule but happen gradually, almost imperceptibly. 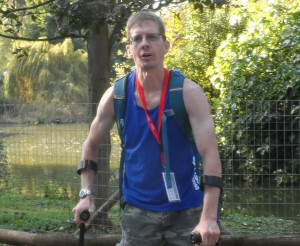 For example, when I was diagnosed in 1997, I could walk unaided. Now I can get around, very slowly, with the help of forearm crutches. It’s not all bad, though. Because I don’t have a job, I was looking around for something else to do with my days and found rock climbing. It keeps me in good shape and I’m pretty good at it; good enough to win competitions. I am currently the defending gold medal champion for the USA Climbing Adaptive National Championships 2015. Climbing has taken me to Colorado, Wisconsin, Massachusetts, New Hampshire, Kentucky, Seattle, Oregon, Georgia, and Spain with Team USA. The Wijit, an accessory that will fit on the wheels of my manual wheelchair, is a lever driving and braking system that can drastically improve both mobility and health. You can find more information about the Wijit at http://www.innovationshealth.com/products/wijit/meet-wijit/. It is an exceptional device. At an annual meeting of the National Ataxia Foundation, I settled into a demo chair with Wijit and felt the stress and tiredness immediately leaving my legs. It’s a good feeling, one I don’t get anywhere else. Even though I was in a nice hotel with flat floors and no hills, I could tell that pushing with the Wijit was easier than a typical manual chair. I didn’t go far, only downstairs to look at a model of the city, but it was so nice to be moving at the speed of other people and not needing help from anyone else. I want a Wijit because of my disease and because of who I am. I consider myself to be an athlete, for which reason I won’t even consider a motorized wheelchair until I absolutely need one. While I am strong, though, disease has made me quite clumsy. Typically when pushing a wheelchair you need to take your hands off the rims to reposition them, but when I take my hands off the rims they don’t want to go back on. The Wijit system has two lever handles attached the wheels which are pumped back and forth, so with a Wijit I would never have to reposition my hands. I could comfortably go up the many hills in my part of Manhattan, and wouldn’t have to burn my hands on the rims going downhill. Please help me get a Wijit by making a generous donation. Thank you.